Once you have chosen your realm and created your character you will find yourself in the Initiation Summit of the starting zone of your realm. Here you can familiarize yourself with Champions of Regnum. Read the tips as they pop up to get all the necessary info. Make sure you talk to the characters you meet. They will help you get started and point you in the right direction. To learn more about the controls in Regnum, please refer to the Interface section. 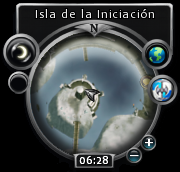 Notice your compass sitting at the top right of the interface. You will want to keep an eye on this as you move around the world to know where you are going, where you have been, and where you want to get to. It also features a zoomable mini-map, as well as a pointing arrow that helps you out while completing quests. Don't forget to heal your character. Your character will naturally regain health and mana even when walking with a drawn weapon. You can regain health quicker and still move your character by putting away your weapon. To regain your characters health even faster, click on the "Rest" icon on your Action Bar at the bottom of the interface. But make sure you are in a safe place because you won't be able to fight from the ground! You can communicate with other players by simply pressing the Enter key and typing in the Message Window in the bottom left of your screen. Press Enter again to send the message. 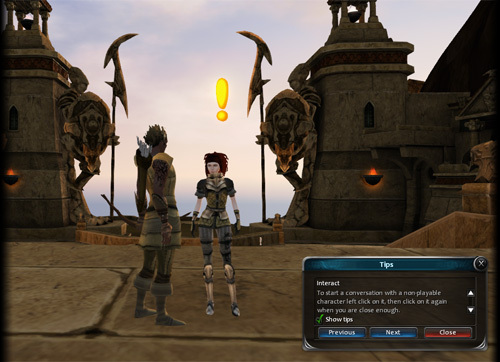 You will see your message show up in the chat box, and over your character's head. You can select different chat boxes using the mouse. The different chat boxes allow you to chat with your fellow realm players, those who are on the vicinity, party and clan members and keep private conversations.